Editor’s Note: As an avowed content geek, I try new formats. People seem to love our interviewette for tabletop designers that is a quick read. We promise no TL;DR. Let’s see how Gil Hova, clever designer of games like The Networks, Wordsy, and Bad Medicine, plus the Kickstarted and shiny new High Rise, does, shall we? BGB: Attention is money, my friend. What is the elevator pitch for High Rise? Gil Hova: I have two. The first is that High Rise is a strategy game of construction and corruption for 1-4 players, where you build tall skyscrapers around a one-way time track trying to supercharge your actions on a board that will change for each game. The second is that it has elevators. Gil Hova: I built the game around an auction mechanism that I’ve never been able to work into a game. Spoiler: this is not an auction game, as I wasn’t able to work it into this one either! Once I removed the auction mechanism, the game sung. I think it’s the best game I’ve made so far. Gil Hova: This is a one-way time track game that gives strong incentives to make big jumps. Lots of similar games incentivize small jumps, which makes them a bit easier to play, for better or worse. Like, I’m a big fan of Tokaido (ed. note: same here), and I think part of its appeal is that its decisions aren’t terribly difficult; most of the time, you want to make the small jump. But in this game, the big jump is very tempting, and the game is full of really hard and meaningful decisions. High Rise on the table! Gil Hova: There’s a difference between time tracks, one-way tracks, and rondels. A time track game has the action happen off the time track. You’ll choose some action, it’ll tell you how much time it costs, and you’ll mark it on the time track. The defining feature of the time track is that player order is determined by the player furthest behind on the track. Thebes, Patchwork, and Tinners’ Trail are games with time tracks, with Thebes and Neuland being the first time track games (that I can tell). A one-way track puts the actions on the track. So you’ll move your pawn directly to the space on the track that shows the action. You can’t go backwards, or to an occupied space. Like a time track, the player furthest behind will go next. Glen More, Tokaido, and yes, High Rise are all one-way track games. I believe Knizia’s Tutankhamen was the first one-way track game. A rondel is a circular structure on a game board that your pawn will traverse. Each space will trigger a different action, like a one-way track. But your movement on the track is restricted; you’ll often have to pay resources to go further than 3 spaces or so. Player order is not determined by position, so it plays totally different than a one-way or time track. Imperial and Navegador are both rondel games. I’m not sure what the first rondel game was. It might be Antike, but only if you don’t consider roll-and-move games to be rondels! I don’t want to tell you about this stuff because I find it gets pedantic and boring after a while! (ed. note: Gil is a great guy, but here, he’s just wrong…) Lines that define games are most useful when using them to figure out how to cross them and blend genres. Like, you could argue that Mancala is a rondel game, but I have no idea what that would accomplish. BGB: Thanks for telling us a bit about High Rise. Let’s wrap up with the key specifics (play time, number of players, and the link to the game) and also, since I think you can tell a lot about a person by understanding their sense of humor, what’s a good joke to close this interviewette? A grandmother takes her baby grandson to the beach. She’s lounging on a towel with her kid cooing and gurgling next to her. Suddenly, a huge wave appears and drenches the beach. When the grandmother regains her wits, she realizes she’s okay, but her grandson is gone. Another wave suddenly appears and drenches the beach. When the grandmother opens her eyes, her grandson is right back on the towel, grinning and giggling. San Diego, CA (March 11th, 2019) —Renegade Game Studios and Oni Press are proud to announce The Aquicorn Cove Board Game designed by Steve Ellis, Tyler Tinsley, Ben Eisner, and Tim Eisner. 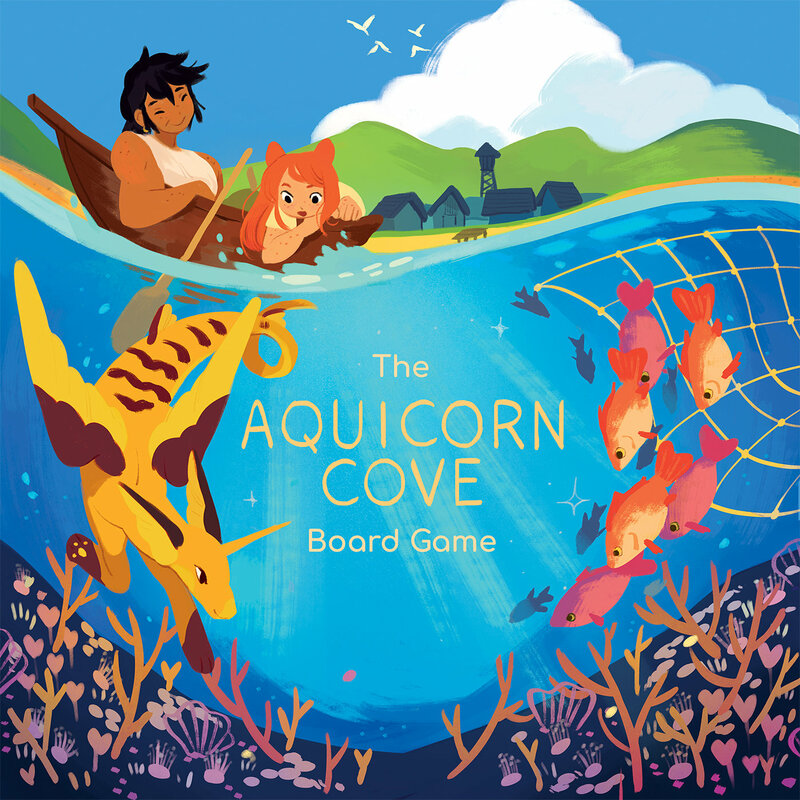 Adapted from the Oni Press original graphic novel by Katie O’Neill, The Aquicorn Cove Board Game will encourage players to dive into an underwater conservation adventure. This delightful board game is expected to release in late 2019. Aquicorn Cove is a cooperative game for 2-4 players. In the game, players take on the roles of members of a small fishing village struggling to survive while maintaining a balance with the natural world. To win, the villagers must feed and grow their village, and help restore the health of the reef and aquatic ecosystem. The villagers are fortunate, though, and the waters of their cove are home to the beautiful and benevolent Aquicorns, as well as the wondrous reef guardian Aure, who can help them both to understand the impact humans are having on the environment, and to save the village. The Aquicorn Cove Board Game is slated for release late 2019. The Aquicorn Cove graphic novel is currently available at all major booksellers. Make sure to join the Renegade Society and be the first to find out more about The Aquicorn Cove Board Gamelater this year! Experience Daring Adventures with Captain Nemo and the Crew of the Nautilus in Nemo Rising—Coming Son! 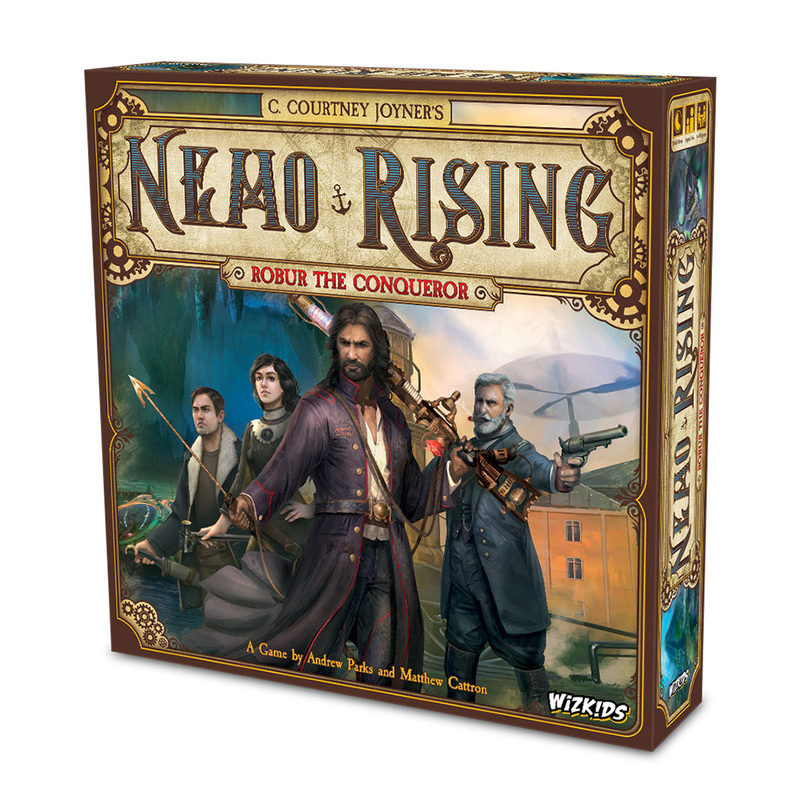 Hillside, NJ – March 4, 2019 – WizKids is excited to announce the upcoming release of Nemo Rising, a cooperative adventure game based on C. Courtney Joyner’s thrilling sequel to Jules Verne’s classic novel! In this exciting 1-4 player adventure game, players become members of a reimagined version of the Nautilus’ heroic crew, and must carry out missions in order to successfully complete the requirements of one of two scenarios— The Undersea Grotto or the City in the Sky. Each scenario represents a unique location with its own geography, environment, and adventures. Players work together to accomplish the Mission Goals outlined on the game’s Mission Cards. Each round consists of two phases, the Action Row Phase and the Player Phase. During the Action Row Phase, a number of Threat Cards will be placed face down in the Action Row, and then the same number of Action Cards will be placed face up on top of them. The Player Phase then begins. During the player phase, each player can move around the board, scout Adventure Tiles, attempt Tasks, and confront Enemy Tokens. Player turns can be taken in any order, and the order can change each round. The game may be played solo, with one player controlling a single Hero. In this case, there are always two stacks of cards in the Action Row during the Action Row Phase. The game ends and the Heroes win if they complete all of the Mission Goals on the game’s two Mission Cards, secure at least 4 Adventure Tiles, and then return to the Start space. All Heroes must be on the Start space at the same time in order for them to win. The Heroes lose, however, if they run out of Mission Points on the Mission Track. With its exciting and unpredictable adventures, Nemo Rising is the perfect way to experience the escapades of Captain Nemo and his crew directly from the captain’s seat. Board the Nautilus and pre-order Nemo Rising, releasing this fall, from your Friendly Local Game Store today! Are you up for the adventure? Editor’s Note: As an avowed content geek, I try new formats. People seem to love our interviewette for tabletop designers that is a quick read. We promise no TL;DR. Let’s see how Chris Handy, inventive designer of many games like Cinque Terre, Longshot and the gum-pack sized Pack O Games series, plus the Kickstarted and perhaps slightly meta game Roland Wright, does, shall we? BGB: Attention is money, my friend. What is the elevator pitch for Roland Wright: The Dice Game? Chris Handy: You play as an obsessed game designer named “Roland Wright” in a 20-30 minute, simultaneous-play “Roll & Write & Erase” game about designing an award-winning “Roll & Write” game. Chris Handy: Color for one thing. I really enjoy working with lots of colors in a game (Cinque Terre, Long Shot, HUE, RUM. BOX…) But also, I wanted to create a line of games within a theme of an “old time” game designer, while really pushing the boundaries for what’s possible in a Roll & Write format game. Chris Handy: We’re offering a creative gaming experience within 20 minutes in the R&W format. We’ve worked to make it a very tight competitive experience, while keeping it at a shorter length. Roland Wright is a game about game design integration, making mistakes, editing… and cramming as much into the box, while knowing what to exclude. This is the core aspect of the game. Love the artwork on this game – ed. Chris Handy: I’m not sure there’s anything that I don’t want to tell you, but there’s an interesting fact about the early stages of this brand. I had a few games developed for a line of Roll & Writes, and I happen to see a tweet from Daniel Solis (Graphic designer and game designer). He posted a picture of a box top of a Roll & Write game, with a faux brand called “Roland Wright”. I approached him about buying the brand concept, and within a few weeks, we made a deal. This really helped shape this game, and the games that will come next in the line…and I’m thankful for Daniel’s brilliant idea. BGB: Thanks for telling us a bit about Roland Wright: The Dice Game. Let’s wrap up with the key specifics (play time, number of players, and the link to the game) and also, since I think you can tell a lot about a person by understanding their sense of humor, what’s a good joke to close this interviewette? Chris Handy: Roland Wright is for 2-5 players, ages 13 and up. The game plays in 20-30 minutes. Go to www.RolandWright.com for more details. The rope leaves and goes around the corner. He ties a loop near his head and whips out his hair on the tip. Ed. Note: The editor has played an early-release copy of Roland Wright and enjoyed it a lot. Expect a preview review next week or so. 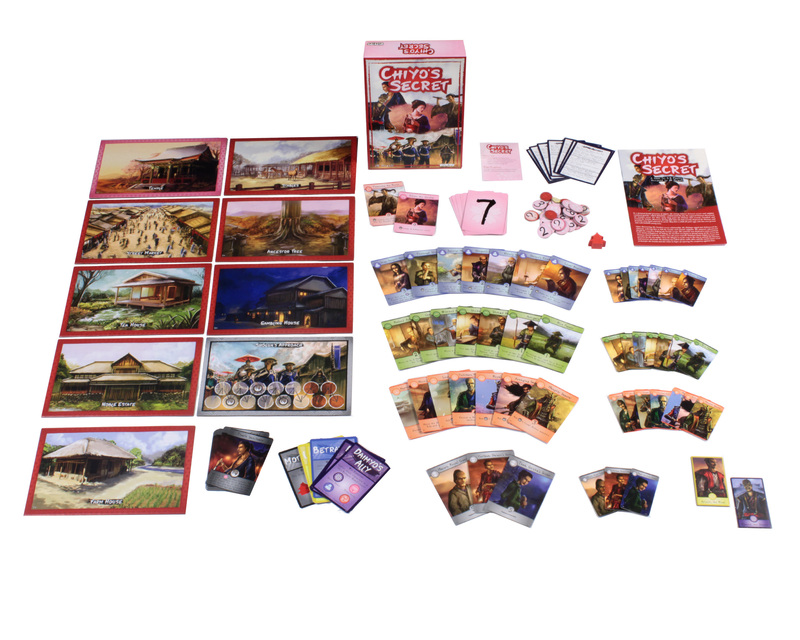 Hillside, NJ – February 27, 2019 – WizKids is excited to announce that Chiyo’s Secret, its new game of deduction and subterfuge in feudal Japan, is now available in North American Game Stores! With over 140 components, Chiyo’s Secret will have players deciding the fate of these star-crossed lovers, the daimyo that pursues them, and, ultimately, the entire kingdom. Chiyo’s Secret is available at your Friendly Local Game Store or online today! Within the Kickstarter campaign of Dodoresque: Jungle Fever in June 2018, the question came up if there was a way to play the game with more than just 4 players. The way to go was to simply combine two copies of the game. Having mixed feelings about this, the designers/publishers came up with a second version of the game, playing pretty much exactly like the first version, but including all new artworks, characters, landscapes and new special actions – and to allow for up to 8 players on the table, when both versions of the game are combined. Dodoresque is a funny, easy to learn and quick to play card game for 2-4 players. Each player takes the role of a Dodo, who tries to build the prettiest nest of all in order to find a mate. To get the material cards for that nest, the Dodos have to go on adventures in card decks of 3 different difficulties. In order to get the materials, and not get eaten up by the dangers in the jungle, the Dodo players need the right action cards on their hands to counter certain effects. The game consists of 3 different actions: Adventure, Exchange and Building. On each turn only two of those actions can be played (also never the same action twice). With that the game is a constant circle of trying to get the right action cards in order to go on adventures to get better materials. The game ends when one of the card decks is used up or one of the Dodo players has lost too many hit points to continue building a nest. To score points each material card has an individual value, it is also necessary to collect 3 different types of material and if possible, even of the same theme to score extra points. Dodoresque: Cherry Blossom is now live on Kickstarter for just 7 days. Price starts at €15 for the game in the Early Bird Edition within the first 48 hours of the campaign. The Gist: The fine Raiders of the North Sea from Renegade Games (in the US) introduced us to the connected game systems of designer Shem Phillips, who has constructed a lot of different middle-weight games using his mix of worker placement, card deck variation, and tight resource management. While the others in his first trilogy may not be the strong winners that Raiders of the North Sea has proved to be, they have their charms and made me excited for Architect of the West Kingdom, the lead title in a new series. Architects hearkens back to Raiders in a pleasant way, in both its commitment to an interesting implementation of worker placement and snappy playtime that makes you feel like you had a pleasantly middle-weight experience even with relatively light play. What’s Interesting: There’s much to like in Architects, but the compelling piece for me was the management of a large number of workers, some of whom are permanently removed from the game when you do build actions, and some of which you can claim back, both through ‘capturing’ them yourself, or when other people do it to break up your group on a space. Before I played, a friend of mine said, “Oh, you won’t like the ‘take-that’ element of the game.” Should couldn’t have been more wrong; this is an intriguing way to let a player stop a dominant component, but it probably isn’t worth it to just ‘mess with people’ (which is NOT fun, in my view). Architects is a really good design. My Take: Architects of the West Kingdom is good enough that I’m in the market to trade for it, but not go splurge on it new. I think it’s a very good game and I’m keen to play it more, but it doesn’t add something so new and vital to my game collection that I need it RIGHT NOW. I think it’s good to modulate those urges. The Gist: The original Azul from Next move and Plan B Games, is one of my favorite light games of the last decade. This gem from Michael Kiesling deserved took home the SDJ honors and I’ve gotten a lot of play out of this simple-to-explain and challenging-to-master title. While I expected an Azul Dice Game (surely coming), a card game, and more, Azul: Stained Glass of Sintra showed up first instead (well, if you don’t count those Jokers and alternate tiles – yes, I have them all). ASGS gives you new scoring methods, with the distribution that is the centerpiece of Azul staying the same. What’s Interesting: ASGS gives you a lot more choices in how you allocate the tiles you collect. With options to move your glazier around and put smaller and larger sets of tiles into your glass windows, ASGS feels like a more gamer-friendly version of the original. There’s certainly more to consider than the original game and it feels like a pleasant variant for people who love Azul but have overplayed the original game. My Take: I quite like ASGS but I’m not sure it is a truly necessary purchase for the average individual who likes Azul and gets what they want out of that game. As a completist and lover of variants of games I adore, ASGS will stay in my collection. But for minimalists or Marie Kondo fans questioning the amount of joy brought to them by each game taking up precious shelf and life space, sticking with the original, more attractive Azul will work (the ‘glass’ tiles are less appealing, in my view). The game also doesn’t have anything to do with Sagrada, the nice stained-glass window game that is a trifle more gamer-y than Azul, nor will it replace that game. The Gist: The wonderful Tom Lehmann finally brings the Race for the Galaxy story full circle in New Frontiers, new from the revitalized Rio Grande Games. If you know the history of RFTG and Puerto Rico, you’ll know that RFTG began life as the Puerto Rico Card Game. But then the designer of Puerto Rico did his own (San Juan) and we got RFTG. Now, New Frontiers brings its more compelling theme (IMNSHO) to the board game world. Yes, the similarities are there, but Tom has found touches to bring to the experience in both the logistics of tracking your progress and a new sense of freedom to the RFTG mechanisms. It’s like he Caverna’d his game. What’s Interesting: Really, just enjoying the implementation one of the great game systems in modern board games. Tom is a precision designer of the highest order and it’s easy to see how he tuned this wonder to work so well, providing a different experience from RFTG, but one that also doesn’t just stand-in as sci-fi Puerto Rico. I find New Frontiers looser, which means it won’t get ‘solved’ in the way Puerto Rico was. Also – have you SEEN the components? (Keanu Voice): Whoa. My Take: You can always tell I love and was ready to buy the game after one play. That said, if you don’t love Race for the Galaxy, then what is wrong with you? I mean, sorry, if you don’t like RFTG, then New Frontiers may not be your glass of blue milk. Yet, if RFTG frustrated you because of the luck of the draw or the tempo, New Frontiers may be more palatable for you so give it a try. Editor’s Note: As a kind of content geek, I try new formats. People seem to love our interviewette for tabletop designers that is a quick read. We promise no TL;DR. Let’s see how Peer Sylvester, excellent designer of many games (old favorite of your editor: King of Siam), including the new Judge Dredd: The Cursed Earth, does, shall we? BGB: Attention is money, my friend. What is the elevator pitch for Judge Dredd: The Cursed Earth? Peer Sylvester:After getting killed in the Amazon with Lost Expedition you can now get killed (separately, cooperatively, or alone) in the post-apocalyptic world of Judge Dredd. Peer Sylvester: Lost Expedition got inspired by the great book “The Lost City of Z” about Percy Fawcett’s last expedition in 1925 (ed. note: also a film on Amazon Prime). Exploration is difficult to implement well in a game (if you want to it to be surprising and yet not too luck-dependent) and I wanted to see how I would come up with a solution. I also wanted to implement the theme (of the story well). Judge Dredd: The Cursed Earth was the opportunity to translate my original game into an interesting IP (ed. note: intellectual property). I couldn’t pass that up. Peer Sylvester: There are not many game Judge Dredd games. If you like Dredd, you don’t have much choice. But if you don’t (know Dredd): It’s a quick, easy cooperative game, that can also be played solo or with two players, head-to-head, so there is a lot of variety. Plus the artwork is just great. Peer Sylvester: I actually didn’t design this one. I designed the original game and most of the mechanics are translated. This was developed in-house by Osprey Games. I only advised on the design (mechanics, cards, etc.) as a consultant. BGB: Thanks for telling us a bit about Judge Dredd: The Cursed Earth. Let’s wrap up with the key specifics (play time, number of players, and the link to the game) and also, since I think you can tell a lot about a person by understanding their sense of humor, what’s a good joke to close this interviewette? Peer Sylvester (ed. note, added game info): The game plays with one to four players, in 30-50 minutes and is for ages 14 and up. The game is now available on Amazon and at game stores, online and brick-and-mortar. Joke Time: I am German; I don’t do jokes. Editor’s End Note: Judge Dredd is one of my favorite properties and I don’t think any game has yet captured the IP effectively (although I do still have a nostalgic love of Block Mania, the old Games Workshop title). As a fan of Peer’s original game, and this movement of Storytelling Games in general, I’m excited to see his mechanisms applied to Judge Dredd’s unique world. The Cursed Earth sequence is perfect for this concept. To learn more about Dredd, watch the more recent film, Dredd. I cannot recommend the Sylvester Stallone film, although they did try to capture the humor of Judge Dredd (poorly). You can also read the comics, which are excellently illustrated and written. The Cursed Earth isn’t necessarily the starting place (this is), but it is a compelling storyline.